These are three of my best oils which have been specially paired and designed for multi-faceted work to target a specific goal. Use these oils in a layered, supportive fashion for your prosperity work and achieve a multi-faceted effect. It's important to affect the underlying issues, current problems and future obstacles of your work. By using a threefold oil system, this will help you gain control of your outcome. Each oil can be researched here on my site. 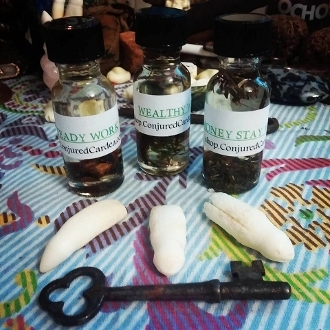 The three oils contained in this set are; Steady Work, Wealthy Way and Money Stay with Me! Use on green, yellow or orange candles.